Whether you’ve got parrots, parakeets, or finches on the brain, a feathery friend makes an amazing pet for you and your family. Some birds talk, some sing, and others chill out and chirp at you throughout the day. If you’ve recently acquired a new bird for a pet or need to find a new brand of bird food for your long-time friend, you’ll want to check out our list of the best bird food options below. And for the newcomers to the bird pet ownership world, we’ve gathered some information on bird care, specifically related to feeding. Birds have a wide variety of dietary choices. Some of these choices are dependent on climate and location, while other things that affect a bird’s diet include size, variety, and season. The best way to choose your bird’s food is by looking through the ingredients list. What fruits, grains, and seeds are included? Are there any added vitamins or minerals? Be sure there are some Omega-3s or Omega-6s as well, as your bird needs these for healthy heart, eyes, and brain function. How Often Should Pet Birds be Fed? The frequency of feeding for pet birds will vary on the breed and size of your bird. Be sure to look up specific information that applies directly to your species of bird. Never make assumptions based on generic information. Below you’ll find a variety of bird foods we found that received high ratings from real bird owners who want the best for their birds. To find the best bird food options to recommend to you, we searched a number of online pet stores and retailers like Amazon and Wal-Mart. We made note of the top-rated options available on those sites, and then cross-referenced across multiple other sites to see which ones were recommended on more than one site. Once we narrowed the list to those bird foods with multiple recommendations, we narrowed the list further to the ones that had the highest ratings across the board. Below, you’ll find this list. Hopefully, you’ll find the right one for your feathery friends. If you are looking for a great daily bird food for your Parakeet, then Dr. Harvey’s Our Best Parakeet Blend Natural Food is a highly rated choice. This bird food is filled with great ingredients that your bird needs. It’s a blend of seeds, fruits, nuts, vegetables, bee pollen, and herbs made for exclusive use with parakeets. If you want a bird food that not only promotes the optimal wellness in your feathered friend but also takes the guess work out of providing the best nutrition, then this is a choice for you. This bird feed is only made with the highest premium ingredients. You won’t find any chemicals, preservatives, synthetic ingredients, or dyes present in this feed. Feed your bird food it LOVES and needs, not just what it needs. Hand Packed Nitrogen Flushed, No added preservatives, Best Quality Large Parrot bird food blend available. Don't just feed boring brown or artificially colored pellets! They certainly do not eat pellets from pellet trees in the wild lol! Yes, your bird deserves the best because they are worth it! Fantastic food for your Large Parrot such as Blue and Gold Macaws, African Greys, Umbrella Cockatoos, Yellow Naped Amazons and similarly sized birds. Yes, your bird deserves the best because they are worth it! Tested and Proven diet birds LOVE to eat and thrive on. Compare to leading brands who list a series of chemicals. Our food is has REAL food! Fruits, nuts, seeds, veggies, and no fillers or added preservatives because we nitrogen flush every bag! A great choice of bird food that can be used for a variety of birds is the All Natural Garden Blind Bird Food. As stated, this food can be used a variety of birds including parakeets, cockatiels, lovebirds, Quaker Parrots, macaws, conures, cockatoos, and a variety of other sizes birds. 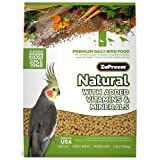 This is a great food that your bird with love, while getting all the nutrients it needs. Each bag of this bird food is nitrogen flushed, hand packed, and never has any preservatives added. A great selling point of this food is that it is not the typical boring brown pellets that make up most bird food. If your bird was living in the wild they would not be swooping down to eat brown pellets, so why not give your bird a food that closely resembles their natural diet? You can easily tell this is an all natural blend by reading the ingredients list. You’ll find nuts, seeds, fruits and veggies all listed. When you are actually capable of pronouncing every ingredient without the aid of a chemistry textbook, then you know you are dealing with real ingredients. Furthermore, this company uses a patented technique for drying the fruit in such a way that it does not all get clumped together in the bag. It is safe to store any excess food in your kitchen freezer for future use. Since 1968, ZupPreem has been providing both professionals and pet owners with high quality and nutritionally complete diets. Zupreem 230353 Natural medium bird food is a highly rated, and another example on how this company is making quality food. This is a great choice for providing a healthy food for your treasured avian friend. This food will provide a complete and balanced nutritional meal where your bird gets every vitamin and mineral he needs. This food is designed with Senegals, lovebirds, cockatiels, Meyer’s parrots, caiques, Jardine’s parrots, conures, and a variety of other small parrots in mind. A great thing about this bird food is that it is nutritionally balanced in such a way that your bird will not need to take any supplements. This food is made from celery, beets, watercress, spinach, and carrots that are ground up from the freshest vegetables. In order to avoid the use of artificial colorings, this food is presented as naturally colored tan oval-shaped nuggets. This food has such great natural flavoring that even the most finicky of birds are willing to eat. Furthermore, the natural products in this food make it easier to digest than cold pressed pellets. And unlike seed mixtures, this food offers maximum digestion and nutrient absorption. Part of the design of this bird food includes iron levels that are controlled to be less than 80 parts per million. If your veterinarian gives the go ahead, this diet could be great for your bird if they are of a species which is predisposed to iron storage diseases. 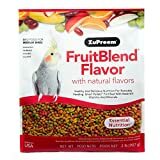 ZuPreem Avian Maintenance Fruit Blend Premium Bird Diet for Medium Birds is a great bird food choice. This bird food is intended for all types of both lovebirds and cockatiels. It is designed to provide your bird with a balanced nutritional daily diet that they need for optimum health and happiness. The feed comes in five fruit shapes, and in five various shades of crazy color that will attract your birds attention. Each bite contains fresh ground up fruit, and delivers 21 vitamins and minerals. This means you won’t need to supply your bird with any additional dietary supplements. This blend from Kaytee is specially formulated for cockatiels. The special blends provide the nutrients she needs to stay healthy and happy, with strong muscles, bones, skin, and feathering. Overall, the ingredients pack this clean diet with DHA Omega-3 fatty acids for healthy heart, eyes, and brain, and prebiotics and probiotics for healthy digestion. 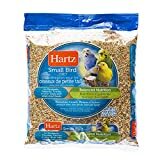 This special blend from Hartz is made specifically for small birds like parakeets, finches, and canaries. These little guys need diets lower in fat, and tons of nutrients to keep them healthy and happy. The blend of ingredients in this mix has tons of vitamins, antioxidants, and Omega-6 fatty acids that are optimum for your bird’s health. This blend also helps support healthy feathering, and has such tasty flavoring that even picky eaters should find contentment. Made With Real Eggs And Honey That Your Bird Will Find Tastes Great. 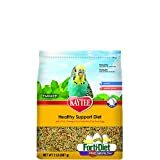 Your parrot needs a diet rich in protein, and this bird food provides that through real egg crumbles. There are tons of vitamins and minerals included, meaning you don’t need as many supplements. This unique blend is full of interesting shapes and textures that will interest your bird, and the flavor is highly palatable, so your bird’s going to love the taste, too. 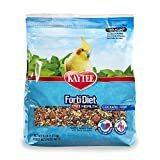 This bird food from Kaytee is clean, wholesome, and comes conveniently packaged in a resealable bag. 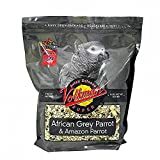 This special blend is designed for African Grey Parrots and Amazon Parrots. The flavorful mix has tons of healthy, delicious seeds they’ll love, plus a great medley of fruits like apples, cherries, papayas, mangoes, peaches, pears, plums, blueberries, and cranberries. 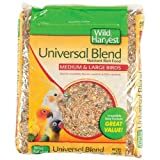 This food from Volkman has been triple cleaned to eliminate dust, and there’s some cuttlebone added for Calcium and other Vitamins and minerals your bird needs. There are also additional Vitamins added in to make sure that your bird gets the nutrition she needs. 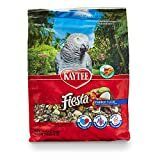 Your parrot loves fresh fruits, vegetables, seeds, and grains, and Kaytee Fiesta Variety mix offers that. This amazing blend also offers fun shapes, colors and textures that they’ll love eating and playing with. The chosen ingredients ensure your parrots get Omega-3s and probiotics that help with healthy heart, eye, brain, and digestion. And this blend is so fun and tasty that even the pickiest of parrots are likely to love it. Wild Harvest provides a healthy blend of exciting ingredients your bird will love. The blend is designed for medium to large birds, such as cockatiels, parrots, love birds, and other hook bills. The formulation considers things like vitamins and minerals your feathery friend requires for optimum health, and always uses fresh ingredients. This premium food from Brown’s is specially formulated for parrots. The mix blends together a colorful, vitamin packed ingredients list that offers fun, colorful shapes that your bird will love playing with and eating. This mix should help your parrot engage and explore his natural foraging instincts, and relieve cage boredom. Your bird deserves the best food possible, and that means you need to invest some time into researching. We’ve provided some great options that we think are top notch, based upon the reviews of real bird owners. But don’t be shy about researching on your own. Be sure to look through the ingredients lists, the reviews from real pet bird owners, and any precautions that may be listed. And always make sure you’re getting the right food for your variety and size of the bird.